Kitchen Window: Corn, East Indian Style A nearly ubiquitous ingredient in American foods, corn turns up less often in India. But when it does, it's often fresh, hot and abundantly seasoned. Food writer Monica Bhide serves this American summer staple with a twist: spices from her native India. 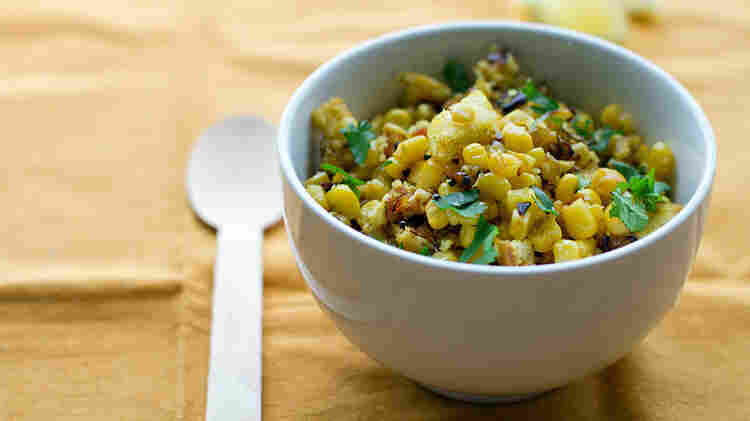 Get recipes for Bread and Corn Salad, Rice with Corn, and Peanut Tikkis with Tamarind-Date Chutney. On my last visit to India, I happened upon a tiny food cart that was selling boiled corn kernels in cups. The vendor was seasoning it with chili, lime juice and butter. One taste and I was hooked. 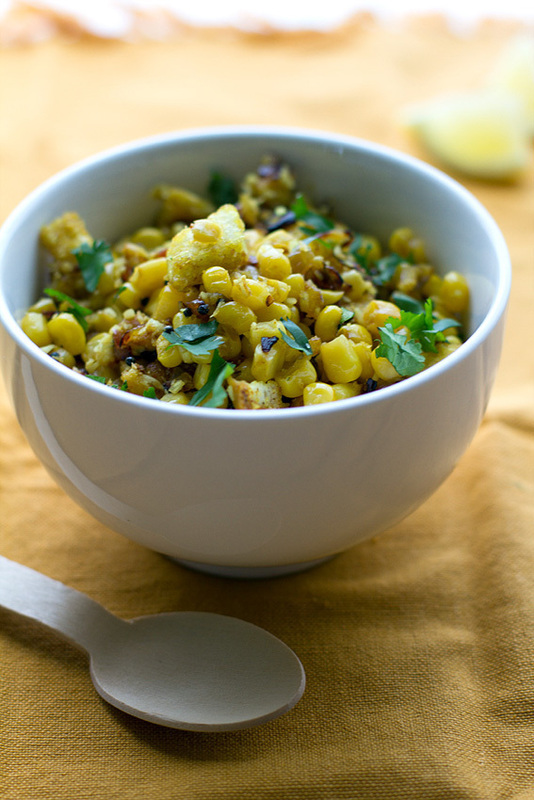 Growing up in an Indian household, I learned only three ways of eating corn (called maize in India): roasted with spices, curried with spices and fried with spices. It was only when I came to the States about 20 years ago that I learned that corn could be eaten without spices and with butter. While I prefer using fresh or frozen corn, in many parts of India, corn also is dried and then pounded into a coarse powder. This coarse powder or flour is mixed with spices and used to make the popular makkai ki roti, a type of griddled corn bread. Fresh corn is used in salads, eaten on the cob with spices and used in breakfast dishes such as corn upma in which it is cooked with grains and vegetables. One of the most popular uses is in sweet corn chicken soup. When I was a child, it was served in our house at least once a week, and now I make it for my own kids at least once a week: Saute onions, add a touch of ginger and loads of chicken stock, a can of creamed corn, sliced scallions, salt and pepper. When the soup comes to a boil, reduce the heat. Beat an egg and slowly pour it into the bubbling soup. It will become stringy as it cooks. Corn does not, however, share the same popularity in India that it enjoys in the U.S. "We've never developed a process like nixtamalization [soaking corn in an alkaline liquid before using it] to unlock the nutrients and alter the structure," Vikram Doctor, an editor at the leading Indian Economic Times newspaper who frequently writes about food, gave as one reason. "Our makki ka atta [flour made from corn] is very different from nixtamalized masa, and since corn has no gluten, we can only make heavy breads, not lighter ones like tortillas. I think this is also an indication that corn is a relatively recent import into India, which is why we've never developed a parallel process." While India is the fifth largest producer of corn in the world, the usage there is not that high because of competition from wheat, rice and other traditional millets. One of my personal favorite ways to cook corn is to grill it. I husk the corn and grill the ears for about 10 minutes, turning them several times. Once it is grilled, I drench it with lemon juice and season it with cayenne and chat masala (an Indian spice mix that is tangy and salty — and to die for). Some friends swear that soaking the corn in water (still in the husks) before grilling it makes the kernels more tender because the extra moisture helps steam the corn kernels when placed on the grill. Sometimes I cut the roasted ears in half and remove the kernels with a sharp knife. These roasted kernels make a great addition to salsa, soups, stews, salads and cornbread as well as mixed into potato patties. If it is too hot (or too cold) to grill outdoors, I baste the corn with seasoned oil (such as chili oil or a flavored butter) and roast it in a super hot oven (around 400 degrees) for about 5 minutes or so for a wonderful roasted flavor. On my last visit to India, I happened upon a tiny food cart that was selling boiled corn kernels in cups. The vendor was seasoning it with chili, lime juice and butter. One taste and I was hooked. Now I have the best of both worlds: sweet golden corn with the spices of my childhood in India, and the gentle buttery goodness of life today in America. This recipe is adapted from Modern Spice by Monica Bhide (Simon & Schuster 2009). 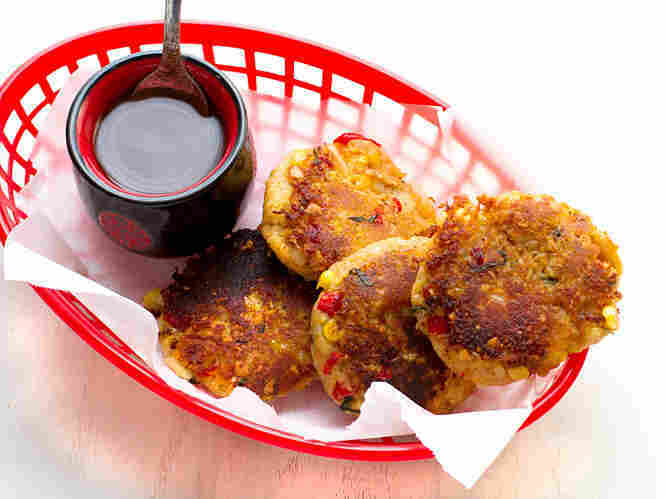 These small patties take practice to make perfect. Make sure the peanuts are not ground too fine. There should be small pieces in the mix. Fry on medium heat to make them perfectly crunchy on the outside and moist on the inside. For the cooked corn you can cut kernels off roasted, steamed or boiled ears, or use well-drained canned corn or thawed frozen kernels. (One medium ear yields 1 to 1 1/4 cup kernels.) Once fried, the tikkis can be kept warm in a 200-degree oven, but they won't stay crisp. Place the potatoes in a large saucepan and cover with an inch or two of water. Bring to a boil over high heat and cook until fork-tender. Drain well, then mash. There should be a range of textures. Add the bell pepper, crumbs, corn, pomegranate seeds (if using), salt, cilantro, peanuts and ground chili (start with the smaller amount). Mix to combine and taste for seasoning; add more salt and chili as needed. Divide the mixture into 10 equal portions. Use wet hands to form each portion into a ball, then flatten it into a small round tikki (patty). Set the patties aside on a plate. At this point, the tikkis can be covered and refrigerated for up to 2 hours. Line a large plate with a few layers of paper towels. Heat 4 tablespoons of the oil in a medium skillet over medium heat until the oil shimmers. Add about half of the tikkis and cook for 2 to 3 minutes, until golden brown on the bottom. Turn the tikkis over and cook for 1 to 2 minutes, until lightly browned on the second side. Transfer to the lined plate and cover loosely to keep warm. If needed, add the remaining 2 tablespoons oil to the skillet. When it's hot, cook the remaining tikkis. Serve warm, with a little tamarind-date chutney drizzled on top of each tikki. 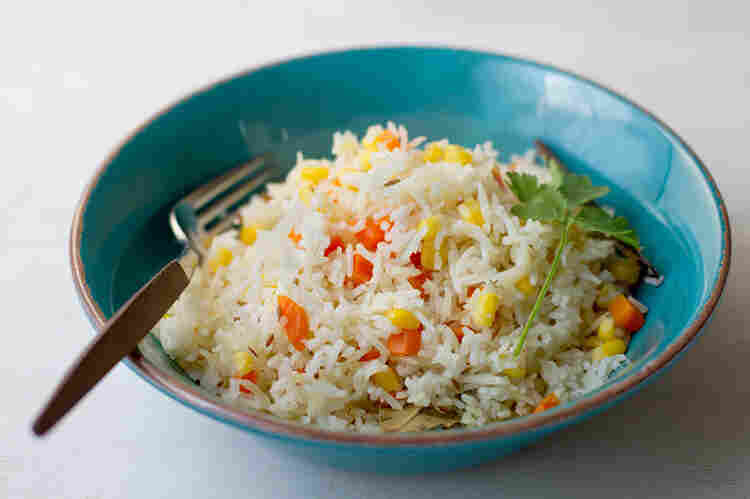 Rinse the rice 3 or 4 times under cold running water to remove excess surface starch. Set aside to drain thoroughly. In a deep pan, heat the vegetable oil over medium heat. Add the cumin, cloves, cinnamon and bay leaf. When the spices begin to sizzle, add the corn and carrots. Saute for a minute. Add salt and the rice. Mix well to coat the rice with the oil. Add the water and stir for a minute. Bring to a boil. Reduce the heat, cover and cook at a simmer for 12 to 15 minutes, until the water has all been absorbed. You will see small craters forming on top of the rice. Remove from the heat and let the rice sit for about 5 minutes. Fluff with a fork and remove the bay leaf before serving. Top with the fried onions, if using. Cut the bread into small pieces. Set aside. In a medium skillet, heat the oil on medium heat. Add the mustard seeds and ginger. When the mustard seeds crackle, add the onion, green chili, salt, turmeric and red chili. Saute until the onions are translucent, 2 to 3 minutes. Add the bread and corn kernels. Mix well and cook for another 2 to 3 minutes until heated through. Remove from heat and transfer to a serving platter. Sprinkle with the coconut, lemon juice and cilantro. Serve warm.